Nearly 2,000 limestone karsts rise from the emerald waters of Halong Bay, Vietnam’s most famous attraction and a treasured UNESCO World Heritage Site. Legend has it that dragons, sent by a Jade Emperor, came down from heaven and planted the unique rock formations to protect the bay from invaders, hence the literal translation of its name: Bay of Descending Dragons. 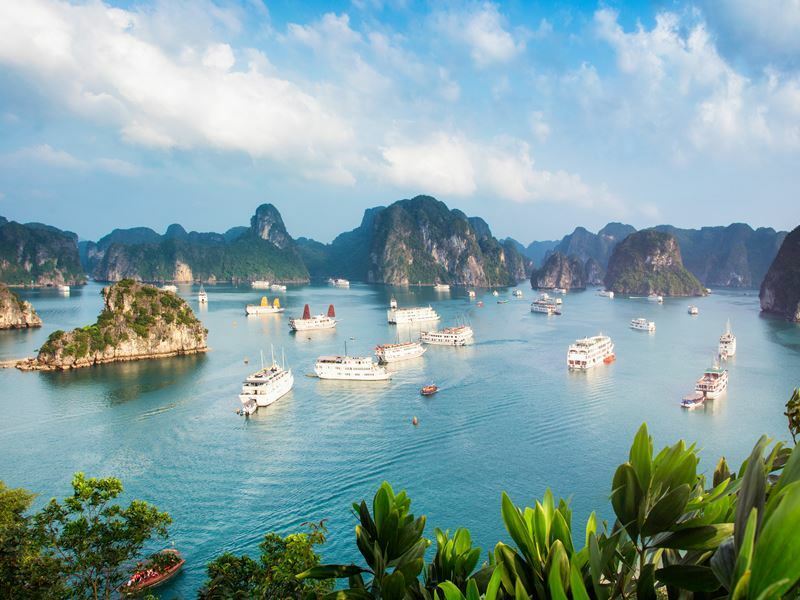 Today, Halong Bay has been named one of the New 7 Wonders of Nature and is an essential stop on any Vietnam tour itinerary for its scenery, floating villages, caves and islands. 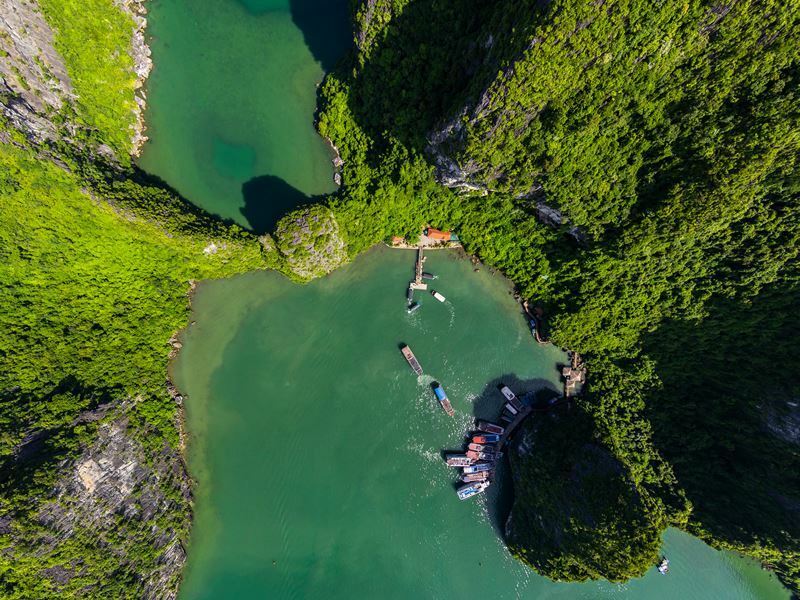 Visitors cruise the paper-flat waters of Halong Bay on rustic Vietnamese junk boats, floating past limestone mounds that reach as high as 100 metres into the sky. Relax on the top deck as you sail past thousands of forest-topped islets, stopping to discover magical caves, sandy beaches, traditional floating villages and mountain viewpoints. Most cruises last two or three nights and include the chance to go kayaking and enjoy night fishing off the deck beneath the stars. Halong has over 120 kilometres of coastline, but boats tend to congregate in the centre of the bay, where 775 rock formations stud the sea, making for stunning sunset and sunrise views. Experience a slice of local life in Halong Bay by visiting one of its four floating villages: Cua Van, Ba Hang, Cong Dam and Vung Vieng. Generations of Vietnamese people have lived in these villages, carving an income from fishing, pearl farming and more recently, tourism. Today, the floating villages are home to around 1,600 people who continue to live this remarkable lifestyle. Kayak past tiny wooden houses tethered together on floating platoons to get a taste of daily life and watch residents load their boats, haul in fishing nets and relax in hammocks. There are even schools, shops, police stations and dogs trotting around. 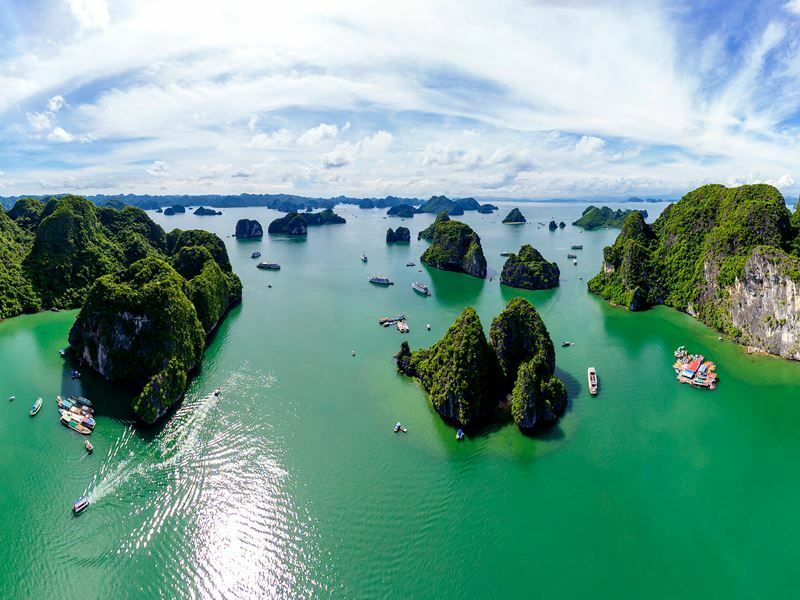 Halong Bay’s limestone islands are a geological wonder. Formed over 500 million years, their soft rock has been worn down by rain, leaving hard limestone beneath. The tropical evergreen bio-system has created islands filled with lush forests which you can hike through to panoramic viewpoints. Sea erosion has also formed inland salt-lakes, immense caves systems and picturesque archways. 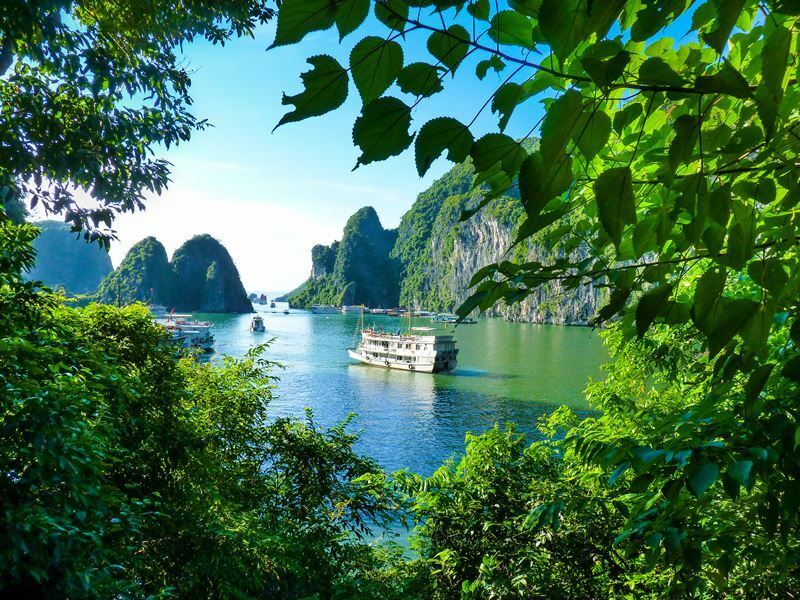 Most of the nearly 2,000 islands in Halong Bay are uninhabited and boast hundreds of species of flora, fauna and wildlife. Titop Island, named by Vietnam’s former communist leader Ho Chi Minh after a visiting Russian astronaut, is a popular sunset stop for its hilltop views of the bay. Many three-day cruises include a night on the bay’s largest island, Cat Ba, which belongs to its own 366-island archipelago. Cat Ba has three golden-sand beaches, a national park which is home to endangered Cat Ba Langurs, and a French fort with sweeping sea views. You can also tour the eerie, bunker-like rooms in Hospital Cave, which was used as an underground shelter during the American War. Most visitors end up exploring the Bo Hon island chain, which has some of the biggest and most spectacular caves, as well as soaring peaks and steep cliffs. If you’re looking for unspoilt serenity, request a stop on Cong Tay which features quiet, coconut-palm beaches. 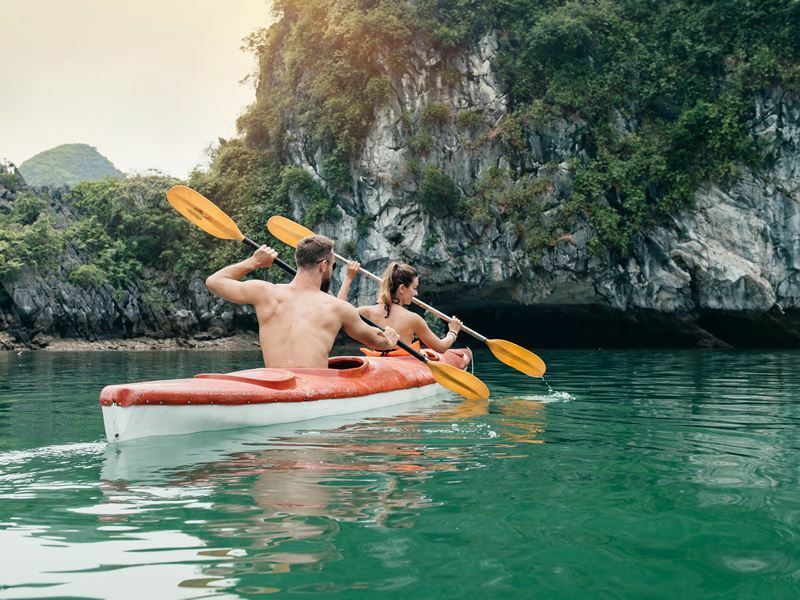 To step off the tourist trail, head for Lan Ha Bay in the Cat Ba archipelago, which is lesser-visited and has natural sandy beaches and water perfect for swimming and kayaking. Dau Be is a good option for snorkelling and diving, with three major salt-water lakes connected by a narrow cave and surrounding waters rich with coral. 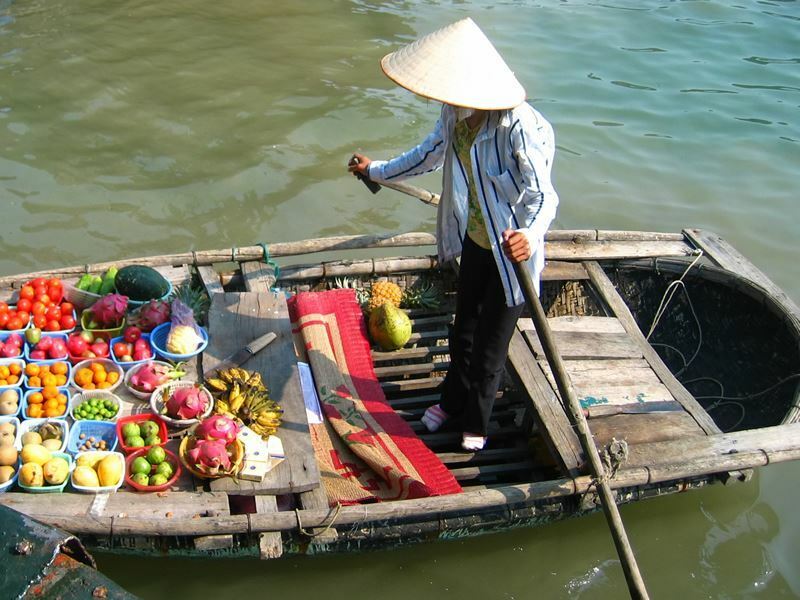 Don’t miss the chance to sample Halong Bay’s fresh seafood as you cruise. The waters are full of crustaceans, over 200 species of fish and around 450 types of molluscs. Most tours offer fresh seafood buffets including crabs, clams, prawns, fish and lobsters which are steamed, grilled or breaded and fried. Specialities include Ngan, a mollusc species, pearl shrimp and snails cooked with garlic and butter. You may even get a chance to go night fishing off the deck for squid, which the crew will prepare and cook up for you. Breakfast buffets typically offer fresh fruit, eggs with bread and Vietnamese noodle soup. No visit to Halong Bay is complete without exploring some of its hidden caves filled with decorative rocks, stalagmites and stalactites. Many have Vietnamese legends attached to them, such as Trinh Nu, which is known as the Virgin’s Cave. According to local stories, a fisherman’s daughter was exiled to the cave after refusing to marry a rich ruler and she died whilst waiting to be rescued by her lover. This legend is symbolised by a girl-shaped rock that sits at the cave entrance, facing out to sea. Dau Go, the largest of Halong’s caves with 25 metre-high ceilings and vast chambers, was named the Cave of Wooden Stakes as it was used to store weapons for combat during an ancient battle. Sung Sot, known as the Amazing or Surprising Cave, has huge chambers with bats fluttering around high ceilings. Notable features include a tortoise-shaped rock and another that resembles a Buddha. At the deepest part of the cave sits the Royal Garden with a crystal-clear pond surrounded by plants and birds. 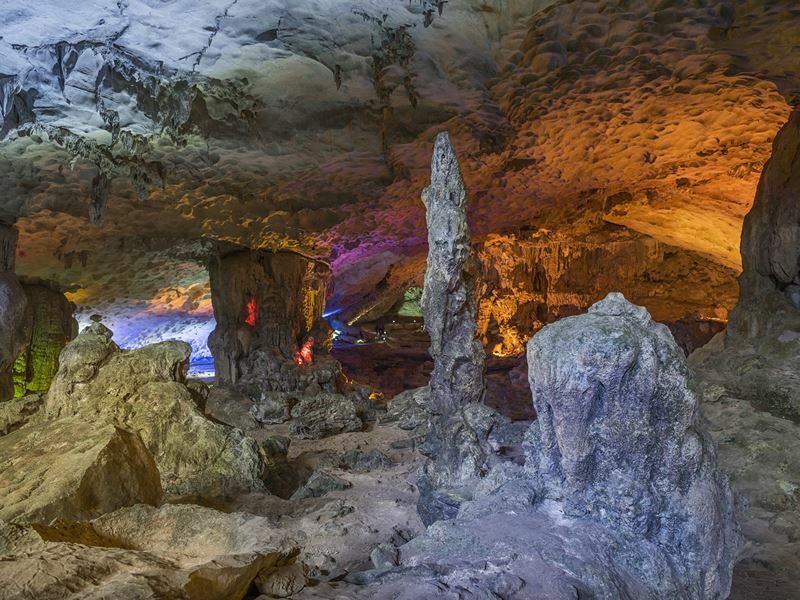 Another popular tour spot is Thien Cung, the Paradise or Heavenly Palace Cave, which is 10,000 square metres in size with multiple floors. This cavern was the setting of a love story between a dragon prince and his bride, whose wedding in the grotto was supposedly attended by animals and gods. 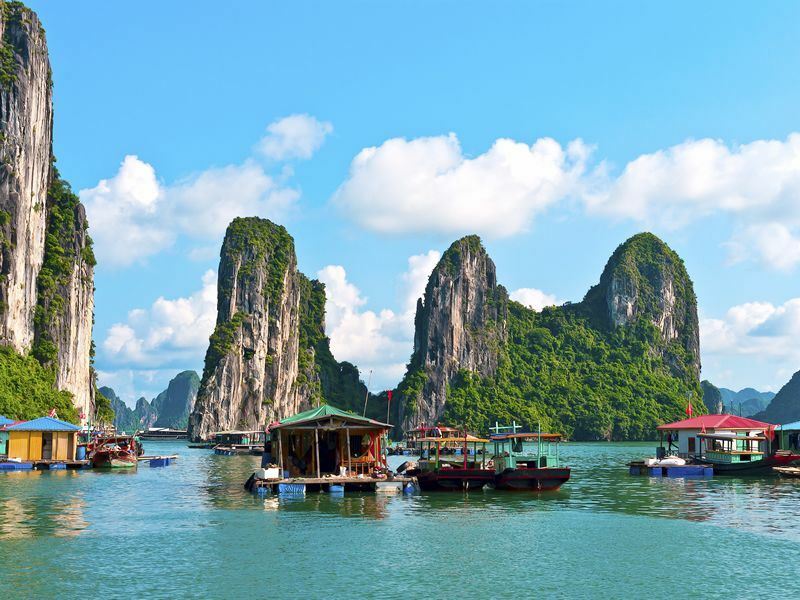 As well as gentle swimming and hiking opportunities, Halong Bay is full of adventure sports. The calm water is perfect for kayaking and most tours offer visitors the chance to paddle independently or with a guide through the bay. For many, this is the highlight of their cruise, gliding across the water surrounded by majestic spires and swooping eagles, past floating villages and through archways to hidden lagoons and beaches. If you’re a rock climbing fan, then the steep limestone mountains and outcrops in Halong provide excellent climbing opportunities, especially in Butterfly Valley on Cat Ba Island, which has over 60 climbing routes. For high-octane adventure you can even arrange parasailing in the bay or take a scenic flight in a helicopter or sea plane. Keen snorkellers and scuba divers will enjoy exploring Halong Bay’s diverse marine and coral life, particularly off Dau Be Island. Halong Bay is a mecca for photographers who come to capture the area’s distinctive geological beauty. Halong’s unusual karsts make for memorable pictures and one of the most popular photography spots is Kissing Rock, which looks like a rooster and hen preparing to kiss. The Dinh Huong islet, which is shaped like an incense burner, is an iconic image of Halong Bay that appears on the 200,000 Vietnamese Dong note. Some other notable formations include a dog-shaped rock on Cho Da islet and Con Coc which, from afar, looks like a large toad basking in the bay. The best panoramic views can be found from Bai Tho and Titop mountains, which are striking at sunset and sunrise, while a seaplane trip will give you unrivalled aerial views of the bay. With their soft lighting, captivating shapes and century-old stalagmites and stalactites, Dau Go, Thien Cung and Sung Sot caves are also a dream for photographers. For idyllic beach shots, head to the more secluded stretches of sand like Ngoc Vung and don’t forget to snap some images of local life in the floating villages as you kayak past. So if you’re visiting Vietnam, schedule a Halong Bay cruise firmly into your plans. You won’t regret it when you wake up on a boat surrounded by the towering pillars and green-hued waters that make this UNESCO World Heritage Site so famous.